Clinical studies have found that engagement in the arts promotes relaxation and reduces stress, anxiety, and depression. Art instruction throughout the retreat is by award-winning artist Cathie Parmelee. You don’t have be an artist to get re-energized by this retreat and make memories with a girlfriend or expand your creative community. We’ve planned the perfect beach vacation to dip your toes in the ocean and step into your creativity. With the increasingly popular trend of coloring for adults, women who don’t consider themselves artistic are enjoying the benefits of creatively de-stressing. 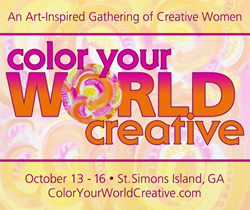 Traci DeForge and Cathie Parmelee, owners of Get Your Muse On, have organized Color Your World Creative, an art inspired gathering October 13 – 16, designed to help women relax and recharge with immersion into creativity over a long weekend. A study published in Art Therapy: Journal of the American Art Therapy Association found that 45 minutes of creative activity significantly lessens stress in the body, regardless of artistic experience or talent. A separate study showed that adults who dedicated two hours each week to creating or consuming art over a twelve-month period reported significantly better mental well-being. Participants of the 2nd Annual Color Your World Creative will be guided to create art that includes crafting an art journal, painting, and designing a mixed media collage. 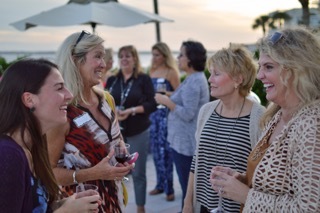 They will also be treated to chef demonstrations of gourmet culinary cuisine and historical tours of Saint Simon Islands, not to mention the opportunity to be inspired by the beauty of one of the top 10 beaches in America with morning yoga on the beach. 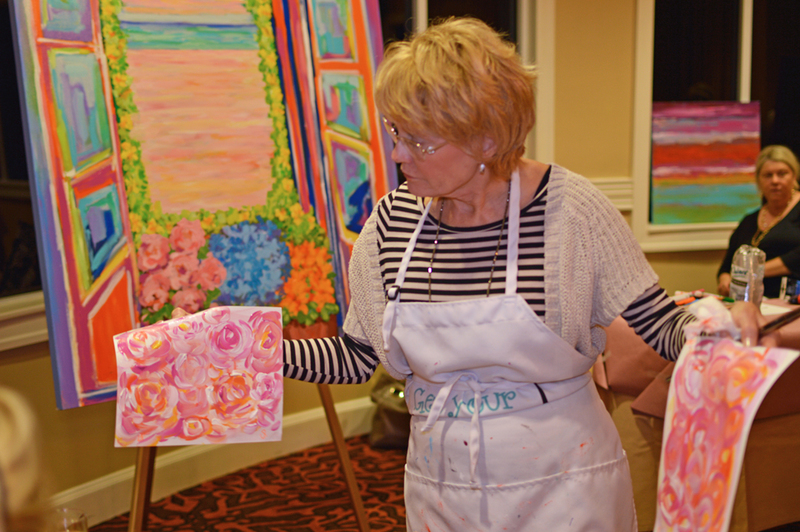 Art instruction throughout the retreat is by award-winning artist Cathie Parmelee, named “Best Local Artist in the Golden Isles” by Elegant Island Living Magazine in 2014. A fourth-generation native and lifelong resident of Saint Simons, Parmelee opened Cathie Parmelee Originals Gallery on Saint Simons Island in November 2015. Get Your Muse On has negotiated discounted room rates at the King and Prince Beach and Golf Resort. In Elegant Island Living's 2015 "Best Of" on Saint Simons, The King and Prince won "Best Resort" and their restaurant ECHO won the OpenTable Diners’ Choice Award in 2015 and 2016. 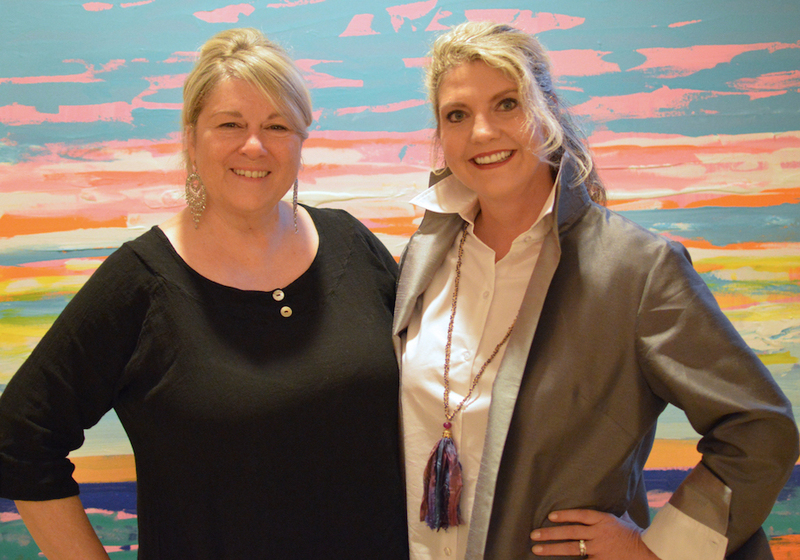 About Color Your World Creative: Traci DeForge and Cathie Parmelee started their business, Get Your Muse On, with a mission to encourage people of all ages to color their world creative. 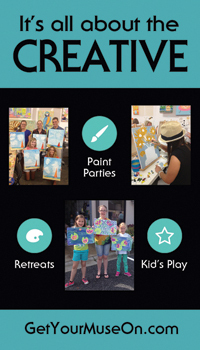 In addition to retreats like Color Your World Creative, they host Paint and Play Parties, Girls Night Out, Private Paint Parties, and workshops for inspiration and painting techniques. Traci DeForge is a nationally recognized business strategist and, in addition to Get Your Muse On, owns a boutique consultant firm for entrepreneurs. Traci dreamed up Get Your Muse On originally as an email address so she could constantly be reminded “Traci . . . Get YOUR Muse On.” This desperate plea to the universe for any sign to encourage her to be more creative led her to Cathie Parmelee and the business was born. Instructor Cathie Parmelee’s work is in numerous private and corporate collections throughout the U.S. and her work has graced the covers of cookbooks and magazines. Photos and interviews available. Contact Traci DeForge at 912-223-9525 or info(@)coloryourworldcreative.com. Participants will be guided to create art that includes crafting an art journal, painting, and designing a mixed media collage. Color Your World Creative offers women the opportunity to relax and creatively recharge at one of America's top 10 beaches. Get Your Muse On hosts Retreats, Paint and Play Parties, Girls Night Out, Private Paint Parties, and workshops for inspiration and painting techniques. Led by the team of Cathie Parmelee and Traci DeForge, the mission of Get Your Muse On is to encourage people of all ages to color their world creative.